Seems like we got here pretty fast, but a fourth of the Packers' season is already behind us. And since it's bye-week, looks like a perfect time to sit back, grab a big delicious beer, review the team's performance, and then rip them new body orifices. I'm selecting my homebrewed Centennial Imperial IPA, which is similar to Bell's Two-Hearted Ale, only hoppier. Ok, ready? Drink! I mean, read! Quarterback: B+. I thought about giving A-Rodg a better grade here, since he's been the heart and soul of this team, along with Charles Woodson. But giving an A to the leader of an offense that has been disappointing at best just didn't seem right. So, the numbers: 60% comp letion percentage, 1100 passing yards, 100 rushing yards, 7 TDs (1 rushing), 2 TOs (1 INT, 1 FUM), 101 QB rating. All very respectable numbers and improvements over last year's numbers, and should be good enough to earn him an A. Except for the two very important stats that have not yet been discussed: 20 sacks, 2-2 record. To be sure, neither of those numbers are all his fault, but he is partly to blame. He needs to get a better internal clock. Or the Packers need to game plan differently due to the lack of a legitimate NFL O-line. But taking 5 sacks a game is just unacceptible and is going to get A-Rodg killed. And it is A-Rodg, not A-Rod. He plays for the Yankees. Running Backs: C. This may be a harsh grade, but I just haven't seen much out of this group. Ryan Grant doesn't seem to be running with the same kind of purpose as he has in the past, the backs haven't been much of a factor in the passing game, and the pass protection, which the backs are a part of, has just been atrocious. The lack of a running threat has really hurt this team, as evidenced by the Pack going 5-wide on 4th and goal from the Viking 1 Monday night. There is certainly room for improvement from this group, especially when Brandon Jackson gets back, but as of now, the backs definitely do not look like a strength. Wide Receivers/Tight Ends: B-. This grade could be higher and I suspect will be much higher at the next check-in. Yes, there have been some big plays (Jennings vs. CHI, Driver vs. STL, Finley vs. MN), but there have been way too many drops. Even guys like Driver and Jordy Nelson have had bouts of the dropsies. And Greg Jennings should never, ever be shut out in a game, as he was against Cinncinnati. And while the Viking game was a coming out party for the tight ends, Donald Lee HAS to catch that ball in the end zone. Offensive Line: F. My mother, as most do, once told me that if you can't say anything nice, don't say anything at all. Defensive Line: B-. Boy, I'm glad that I never had me as a teacher in school, I probably would have flunked out. This was a tough one for me to grade, probably the toughest. I'm not as well-versed with the 3-4 style of defense, so I'm not really sure yet as to what the line's responsibilities a re. 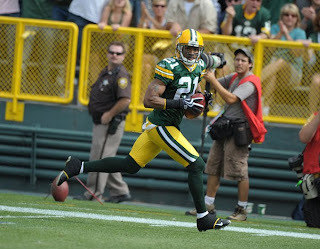 Johnny Jolly has shown flashes of the spectacular, Adrian Peterson was basically as much of a non-factor as is possible, and the Packers did chase Jay Cutler all over the field, all of which are admirable. But they did give up big days to running backs Cedric Benson and Steven Jackson. Boy, I never thought that I'd use big day and Cedric Benson in a sentence together. And the time Brett Favre had to throw was just downright embarrassing. So, with this group, definitely some good, some bad. This unit should get better as they get (hopefully) a healthy B.J. Raji soon. Linebackers: B. Again, not knowing the 3-4 in-and-out, this was a tough one for me to do. 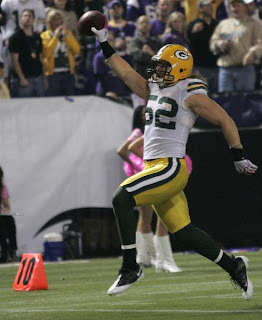 Brandon Chillar seems to be everywhere, Clay Matthews is a playmaker (how sweet was that rip-six vs. MN? ), and I think that A.J. Hawk looks a lot better this year. Aaron Kampman has been quiet, but I think that he'll make some more plays as the season goes on. Nick Barnett seems a step slow, but he's coming off an injury, he'll get back up to game speed. This would have been an A, but letting Cedric Benson dominate a game against you knocks this unit down. I can't believe that I just used Cedric Benson and dominate in a sentence with Benson as the subject, not the object. Secondary: B+. Tough to give a singular grade to this unit for four games. First off, Charles Woodson has been unbelievable. If the Pack would stop giving up four and five sacks a game to one person, Woodson could win the NFL Defensive Player of the Year. That is, if teams keep throwing his way, which I'm guessing they'll do less of as the season progresses. Against Chicago, the unit was very good. Against the Bengals, again, the secondary was solid. As they were against the Rams. However, the old Leader of the Pack absolutely carved them up. Of course, they didn't stand much of a chance, what with the pathetic pass rush that the Pack threw up th ere. Also, due to injuries, the safety positions have been a bit scary, with way too many blown coverages against the Vikes. That alone drops this unit from an A. Special Teams: B. Ok, I'm almost done with my beer (it was a big glass), so I should start wrapping this up. The special teams have been good, not great. Nothing flashy, but nothing abhorrent either. The Bengal game was a little scary, especially the punt coverage team. Crosby is 3-3 with good onside kicks, which is impressive. However, needing to use 3 onside kicks in the first 4 weeks is a little disturbing. Pretty good effort from the special teamers so far. Coaching: C. Don't get me wrong, I'm a Mike McCarthy fan. 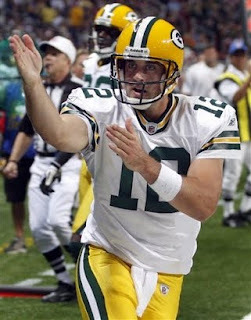 I like him as a coach and want to see him leading the Green and Gold for years to come. So why the C? Because I think that he can do so much better. Two years ago, the Packers started 7-1 without a running game or a decent offensive line. How? Sure, Brett Favre was great, but they had a great game plan. Quick drops, get the ball out, and let the receivers run wild. This year, the Packers are in the same situation, but have not adjusted their game plan accordingly. Way too many deep drops for Rodgers. Maybe Rodgers isn't audibling to quick hitters when necessary or is missing guys, I don't know. But something needs to change. And as for the defense, teams seem to be handling the Packers' attacking 3-4 better each game. Time for Capers to do some adjusting of his own. And with a bye week coming up, he's got plenty of time to do it.